Bostonapothecary is proud to introduce a next generation counter pressure bottler inspired by the infamous champagne bottle manifold. The counter pressure bottler attaches to champagne bottles with the same collar system as the original manifold but also includes a down tube and side port with a second Cornelius fitting for venting or pressurizing. The down tube can also be removed and a check valve inserted to revert the bottling head back to the same functionality as the original design for in-bottle carbonating, reflux de-aeration, or counter pressure to preserve sparkling products. Counter pressure bottling is a fairly advanced procedure and assumes users are familiar with carbonating in Cornelius kegs. There is not much hand holding here so this product is designed to fulfill the dreams of people who pretty much already know what they want to do and how it will work. This product fills a giant hole in the market. Cheap versions, which don’t handle pressure levels beyond beer (and require two man operation) are available for $70 and then nothing worth a damn is available until $10,000. No other product is available that can give you full control at the smallest possible scales. Though slightly technical, counter pressure bottling is safe and liquid is typical only transferred at under 40 PSI which is a small fraction of the working pressure of Champagne bottles. Transfer pressure, because liquid is only being moved rather than forced into solution, is much lower than the pressures used for in bottle carbonation of the original Champagne bottle manifold and is thus a safer procedure. 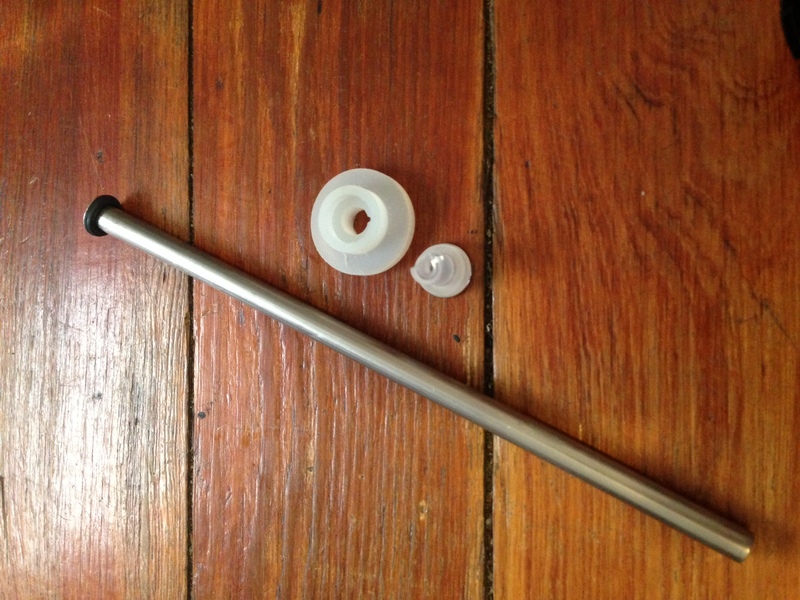 The down tube has been designed as a standard soda keg down tube to keep all the parts familiar. The accessory check valve (included) is from a Guiness type keg coupler so it is tried and true as well as easily replaceable. The check valve slides comfortably into the specially designed food safe seal which engages the bottle. The functionality of going from down tube for liquid transfer to check valve for various non transfer tasks means the tool can be used around the clock and helps justify owning multiple units. Such versatility is not a feature of any competing product at any price range. 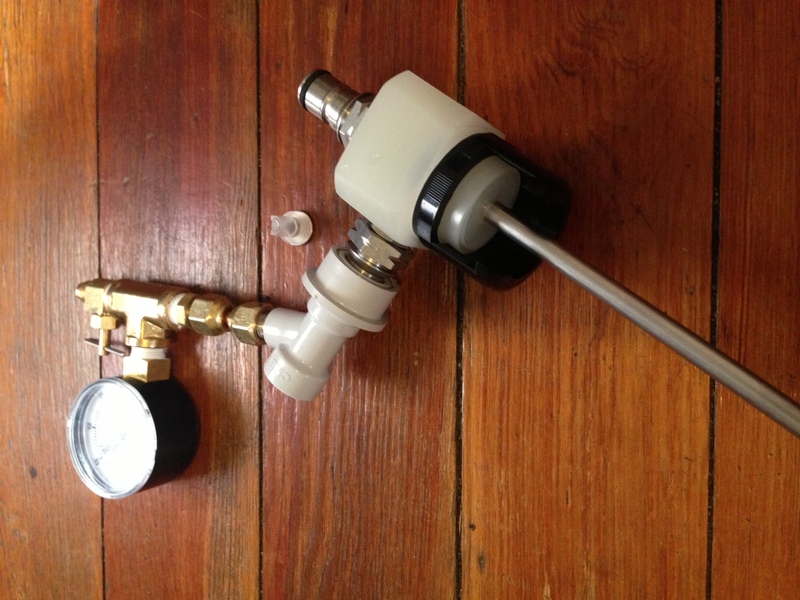 Gas can be bled from the bottles with a “key” which is best done with a Cornelius gas quick release fitting with a pressure gauge and bleeder valve (pictured above). This key is not included with purchase but can be acquired affordably from my favorite supplier, the Chicompany. Champagne bottles, such as magnums, can even be turned into mini kegs and a hose can be placed over the down tube to reach the bottom of the bottle. Gas can then be inputted into the side port to move liquid up the hose instead of down. 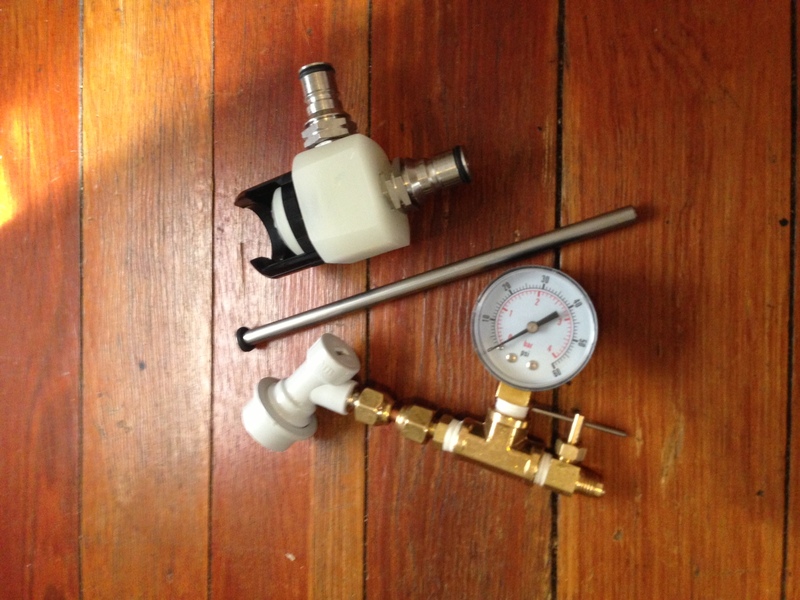 The key can also be used to measure the internal pressure of a keg and when paired with the temperature, can imply carbonation level (a common brewers technique!). Everything was designed with cleanup in mind which is another major strength over competing designs. The Cornelius fittings hold a seal when only thumb tight so disassembly can be done without tools to maximize productivity. The Cornelius fittings have also been proven to hold a seal for months on end which is the reason for using a second Cornelius post instead of integrating a bleeder valve (yes, I systematically explored and tested every option). As opposed to the bulky, large square footage, standing clamp designs of competitors, the small size and portability of the collar design allows all parts to constantly be dunked in sanitizer for cleaning (parts should never be dish washed at high temp because high heat will weaken the seal of the embedded fittings). The bottling head features unique over-molding of stainless steel 19/32 fittings for anchoring and an uncompromising seal. This complicated production technique, typically found only in very expensive medical devices, was made possible by developing a new laser cut acrylic mold box & plastic silicon die technique (that I’m very proud of, woohoo!). The design features many advantages over competitors and the number one is portability and the potential to be used 24/7 for a variety of tasks followed by affordability. Counter pressure bottling requires significant amounts of inactive time (due to physics) so it is not exactly the fastest process. The affordability of the design allows users to own multiple heads for the price of a one head system from competitors. 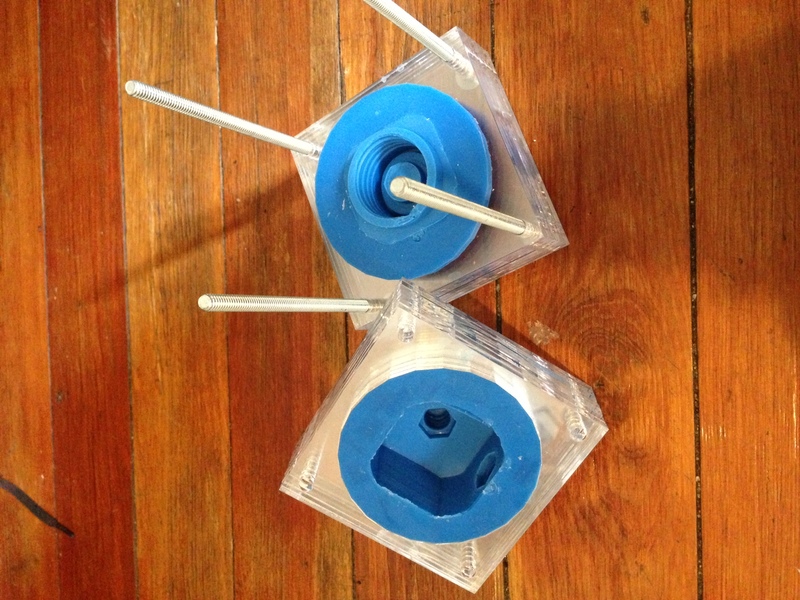 This allows users to purchase more heads at their own pace to reduce inactive bottling time. As one bottle is coming to equilibrium and “bonding” so the manifold can be removed without detrimental foaming, another bottle can be filled and maybe yet another can be capped. Another unique feature is the usage of only Cornelius gas fittings instead of both gas & liquid fittings. Liquid can run through the gas quick release so what this means is the same input at the top of the bottling head can be used to both pressurize the bottle, bringing it up to the same pressure as the keg (as well as flush it using the key), and then be used for the liquid line. The liquid jumper cable going from the keg to the manifold will have a liquid disconnect on the keg side but a gas disconnect on the manifold side. This breaking of the rules means the bottler requires less fittings to function and the force to attach the main fitting presses straight downward over the center of the bottle so as not to stress the seal. SAFETY DISCLAIMER: USE THIS HIGH PRESSURE PNEUMATICS PRODUCT AT YOUR OWN RISK. WE ARE NOT LIABLE FOR ANY INJURY INCURRED BY THE USE OF OUR PRODUCT. ALWAYS WEAR SAFETY GOGGLES WHEN USING THE MANIFOLD. USE ONLY BOTTLES RATED FOR THE PRESSURE YOUR REGULATOR IS SET AT. DO NOT SET YOUR REGULATOR HIGHER THAN 60 PSI OR RISK WILL ESCALATE. BEWARE OF OUR SEDUCTIVE DESIGN AND MARKETING, THIS PRODUCT IS DANGEROUS AND SHOULD ONLY BE USED BY THOSE THAT FULLY UNDERSTAND THE RISKS. DO YOUR DUE DILIGENCE BEFORE YOU OPERATE THIS PRODUCT. Hi, would it be possible to adapt this project and use it on a PET bottle ? I think there is a PET solution out there. I think Wensell was making a homemade version he was welling and I know the Australians who make the stainless steel version of the tap cap had an elegant solution though I don’t think it had really come to America yet. I could make one but I don’t think the demand is really there to divert my time. Next Early Accounts of Arrack Et Al.